You conveniently review scuba concepts on your tablet, mobile device or computer, then go diving with a PADI Professional. It’s quick and easy, and a good way to prepare for your next PADI Course or get ready for a dive holiday. The best part is, divers who complete both the knowledge and in-water skill refresher receive a replacement certification card with a ReActivated date on it. Contact Seasty to get ReActivate Touch or ReActivate Online and start working through the scenarios. 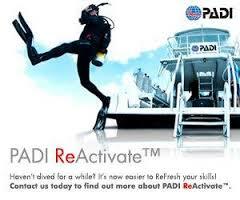 Or, download the PADI App to your tablet or mobile device (if you haven’t already) and purchase ReActivate Touch to get started immediately. Then, schedule your ReActivate water skills session.